What is the Exchange Troubleshooting Assistant? 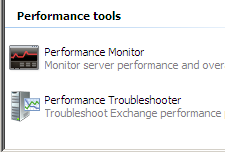 The Exchange Troubleshooting Assistant (EXTRA) was first introduced with Exchange 2003 as a separate download. Since Exchange 2007 it has been integrated with the product. In Exchange 2007, The EXTRA tool is used as the basis for a number of tasks. 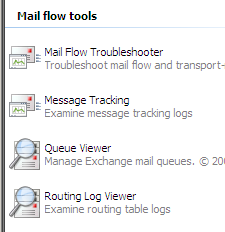 The database tools, Mail Flow Troubleshooter, Message Tracking and Performance Troubleshooter all use EXTRA as their underlying basis. It is important that you use the correct version for your version of Exchange. Using the Exchange 2003 tool against Exchange 2007 is going to give you false results. For Exchange 2007, there is nothing to download. It is built in. You can access it in one of three ways. Each tool has its own instructions, which you should follow and then review the advice given. It may well link to Technet Articles which will provide further information on the issue. You can create shortcuts to these tools, as well as the others in the Toolbox, by using the methods on the Toolbox Shortcuts page.